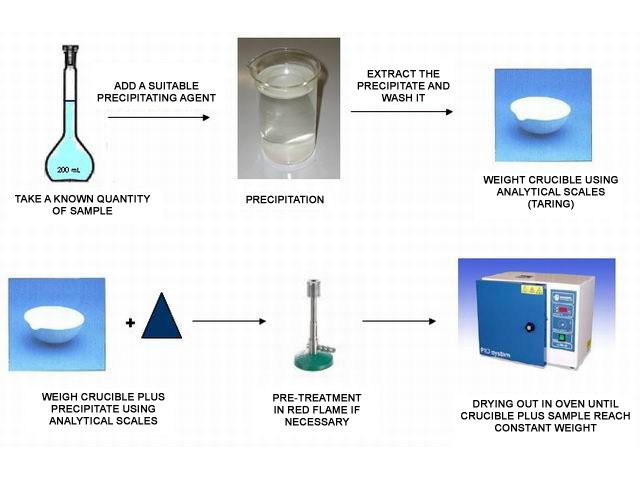 Precipitation method: the analyte is transformed into a precipitate of limited solubility. It is then filtered and washed to get rid of impurities. Iron dissolved in water can be precipitated as a hydroxide, and turned into ferric oxide by calcination. 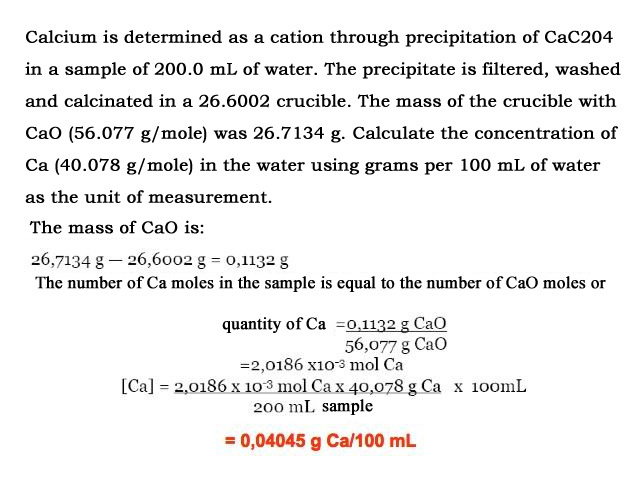 The oxide is determined gravimetrically, and the same number of grams of iron moles are transformed, as were originally present in the solution. Volatilization method: the analyte or the substances resulting from its decomposition, are volatilized at a suitable temperature. By weighing the sample before and after volatilization, we can find out the quantity of the analyte in question. correct weight for air current affecting light but voluminous objects. 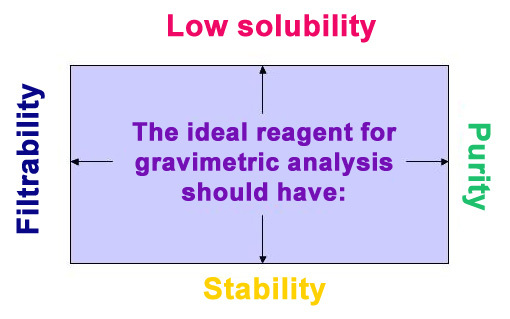 The reactions used in gravimetric analysis are those which produce barely soluble salts. In chemistry, the term solubility refers to the maximum quantity of solute that can dissolve in a given solvent, and it depends on the chemical structure of the two compounds as well as the temperature. 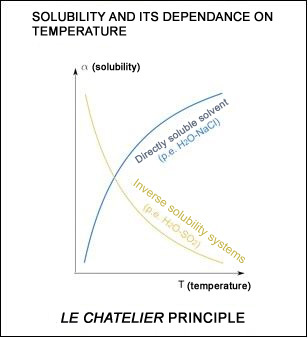 Solubility depends on the solvent. The solubility of a substance depends on the chemical nature of the solvent, which can be summed up in the rule like dissolves like. In fact, when a solute dissolves in a solvent, the molecules of the solvent surround the ions or molecules it is composed of and react with them so that they can be defined as solvented or, if the solvent is water, hydrated. Thus forces of attraction are established between solute and solvent. Ionic compounds are not very soluble in apolar solvents. Their solubility in water varies enormously from one compound to another. 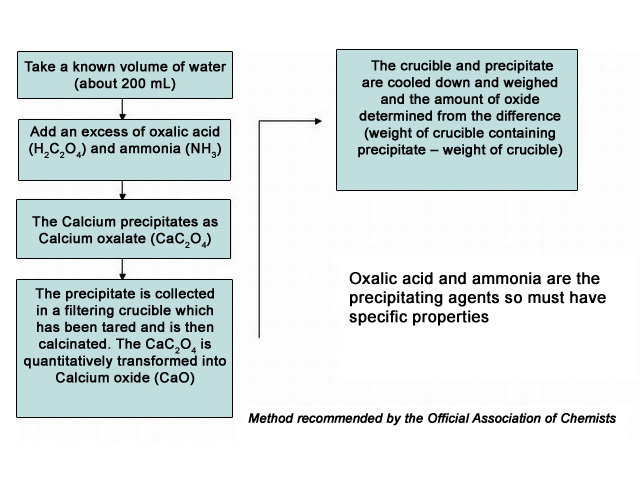 the precipitate needs to be of known composition after drying or even calcination. Not all these conditions are always true. Ease of filtration is proportional to the dimension of the particles. 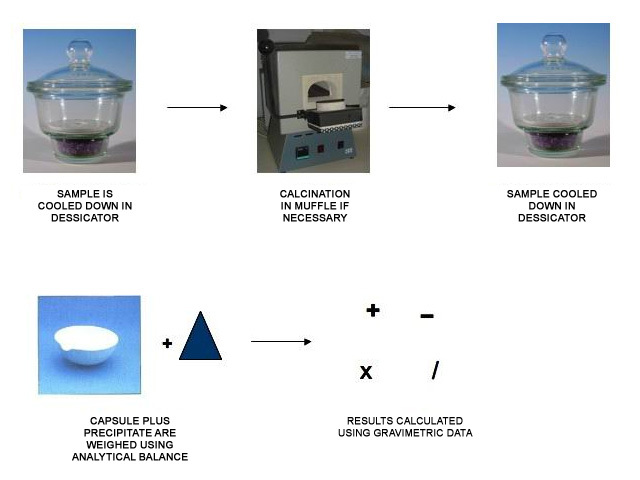 In gravimetric analysis, we usually prefer precipitates whose particles are larger because they are purer, easier to filter and also easier to wash. The size of the particles depends on the individual experiment. 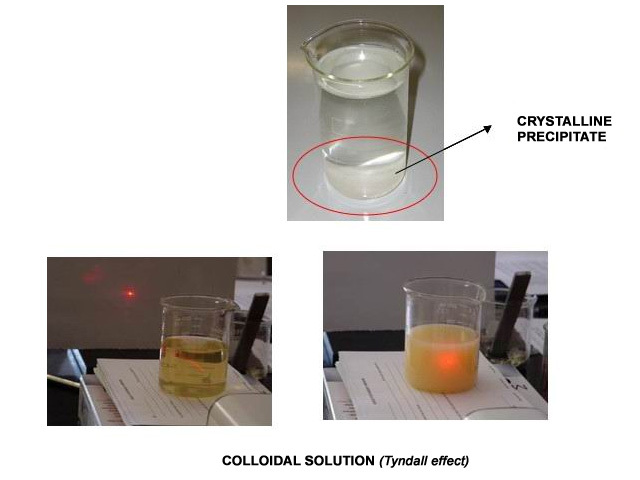 At one end of the spectrum are colloidal suspensions that show no inclination to precipitate and so are difficult to filter. At the other end there are the particles of crystalline suspensions that tend to form deposits spontaneously. To encourage crystallization of the precipitate, or to increase the size of the crystals, we often resort to digestion. This operation involves keeping the precipitate warm for a certain period time. This increases the solubility of precipitate, so the smaller particles dissolve in the solution. The resulting ions tend to attach to the crystal that have already formed. In this way the precipitate becomes purer. The effect of all these variables can be explained by saying that particle size is related to the property termed relative supersaturation. In practice, supersaturation influences one of the mechanisms of precipitation, namely nucleation and crystal growth. Nucleation is the first stage of precipitation and consists in the formation of stable microcrystals that can grow spontaneously, i.e. crystallization nuclei. Further precipitation leads to competition between new and existing nuclei (particle growth). If nucleation predominates, then a crystal will form that is easy to filter. Low supersaturation encourages the growth of existing microcrystals rather than the formation of new nuclei. Higher temperatures also favour the formation of crystalline precipitates, because they increase the solubility of the precipitate (S), and other factors that encourage crystal growth are diluting the solution (Q), and adding the precipitation agent slowly while shaking energetically. mechanical inclusion: the crystals remain very close to each other during their development. The different crystals develop together and a small amount of solution gets trapped inside a tiny sac. 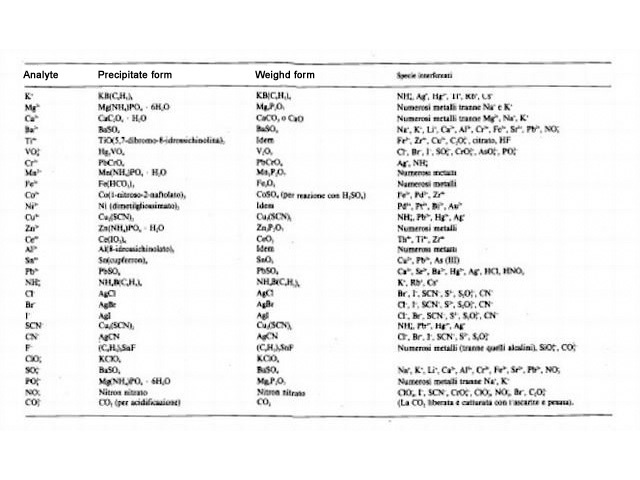 The composition of the precipitation reagent needs to be known after the precipitate has been dried and powdered. After precipitation, the precipitate needs rinsing, drying and calcifying. The choice of liquid for rinsing depends on reducing the risk of adsorption, occlusion and inclusion. Rinsing is usually done using ammonium salt solutions because even though they remain in the precipitate as contaminants, they can be easily eliminated during the following steps of the process because they are volatile. After rinsing, the precipitate is dried, i.e. treated at 100-150°C, to get rid of any last traces of humidity and to make sure that, if calcination is necessary afterwards, none of the precipitate is lost during the process due to microexplosions from the vaporization of occluded water. Calcination takes place in a muffle at max. temeperatures of 475-525°C. 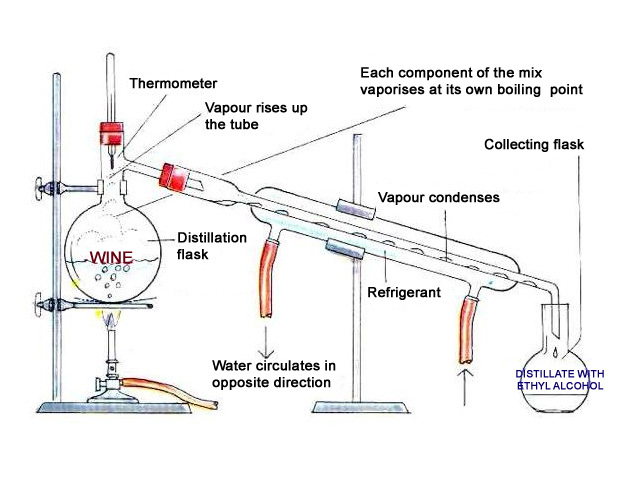 The most common gravimetric method based on volatilization is used for ethanol in wine. Determining the alcohol level is done by distilling the wine and working out the specific weight (using hydrostatic scales) of the resulting hydroalcoholic solution. Special tables (Reichard tables) then enable us to look up the corresponding alcoholic level. The more alcoholic the wine is, the lower the specific weight of the distilled liquid will be. This method is officially accepted and is used to work out the strength of beers and spirits. It must be stressed that the result obtained is usually slightly higher than the real level of the alcohol concentration per volume, because other volatile alcohol substances are distilled along with ethanol. The distilled liquid is collected and then weighed using hydrostatic scales. The weight should then be checked on the Reichard table to find out the alcoholic level of the drink. 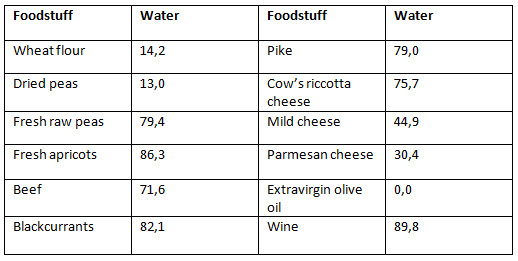 Water is the most common naturally-occuring compounds, is the main component of all biological systems and is the main component of foodstuffs with the exception of certain cereals and their derivatives, pulses and sugar. In many cases, it is possible to determine humidity levels (water) in food using the volatilization method. First of all, a suitable container needs to be tared in a heater at 105°C. This means leaving the container in the oven for at least half an hour. After being cooled in a dessicator, the container is weighed and then reweighed. The result can be considered satisfactory when the difference between two successive readings is less than 3 decimilligrammes. At this point, the sample can be weighed (flour, semolina, butter, etc.) and the procedure is the same, reweighing until the difference in weight between two consecutive readings is no more than 0.3 milligrammes. 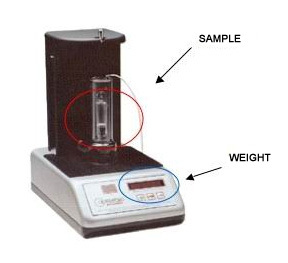 The amount of water in the sample is thus the difference between the second weight and the tare; in general, it is recorded as a percentage (p/p) of the product analysed. Put the dish in the oven at a temperature setting that depends on the sample under analysis, and dry it out until the weight becomes stable. Remember that every time you want to weigh the sample, it needs to be cooled down in a drier first to reduce absorption from the atmosphere to a minimum. N.B. The dish and sample need to be handled using pincers or tampons so they are not contaminated with grease from our hands. Imagine that we weighed about 5.2352 g. of peaches, and that the stabilized empty crucible weighs 25.600 g.. At the end of the drying process, the weight of the crucible plus the sample was 26.3825 g.. Calculate the absolute humidity and the humiduty content of the sample.